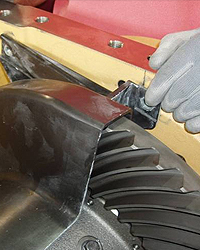 Ashley Industrial Molding, Inc. manufactured the oil deflector shown here for a well-known agricultural equipment manufacturer with an aggressive plan for converting functional components from sheet metal to plastics in order to reduce secondary operations, weight, and cost. Our engineers determined that compression molding would easily accommodate the design complexity of this component, and utilizing molded-in color sheet molding compound would provide an elevated level of strength and chemical resistance combined with the desired light weight properties. These oil deflectors have overall dimensions of 550 mm in length x 250 mm in width x 265 mm in height. Tight control over tooling quality and process parameters allowed us to manufacture them within ± 0.25 mm tolerances and with a Class C surface finish. 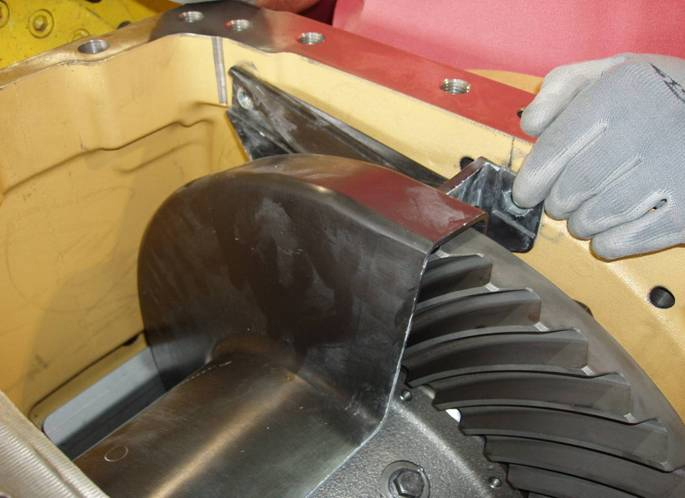 Light assembly operations incorporated installation of compression limiters, which would prevent the plastic deforming under the compressive loads generated by tightening bolts during equipment assembly. Testing and inspection confirmed we met the customer standards for uniform thickness, chemical resistance, and temperature/oil property retention. Contact us today if you are interested in learning more about this project or how our proven expertise for converting metal parts to plastic can improve your next application. PrivacySite MapSite created by Thomas Web Solutions© 2019 Ashley Industrial Molding, Inc.